What is hot rolled seamless steel pipe? According to the production method, seamless steel pipe is divided into hot-rolled seamless steel pipe and cold-rolled seamless steel pipe. Hot-rolled seamless steel pipe is a large category of seamless steel pipe. Hot rolling is relative to cold rolling, cold rolling is carried out rolling at room temperature, and hot rolling is carried out rolling at the recrystallization temperature. Seamless steel pipe is named relative to the welded steel pipe, seamless steel pipe is usually made of round steel perforation and reprocessing, welded steel pipe is usually welded by steel plate in different ways. The diameter of hot-rolled seamless steel pipe is usually above 38mm. Seamless steel pipe with smaller diameter can be obtained by cold rolling or cold drawing. Next, Great Steel Pipe will introduce the process of hot-rolled seamless steel pipe for all of you. 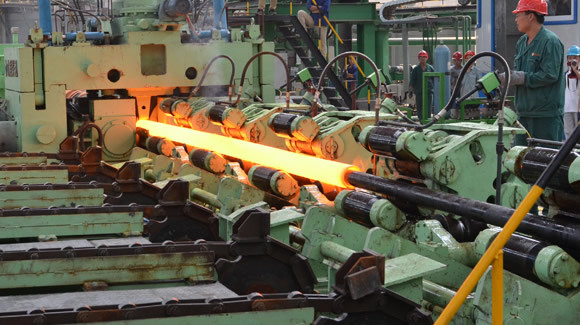 Hot-rolled seamless steel pipe is generally produced on automatic rolling mill units. The solid bar is inspected and cleared of surface defects. Then it is cut into the required length, and centered on face of the perforation end of the pipe billet. And then it will be sent to the heating furnace to heat, and bore a hole on the puncher. In the perforation, the solid bar will continue to rotate and forward at the same time, in the role of the roll and the head, the tube billet internal will be gradually formed cavity, that is said capillary. And then it will be sent to the automatic rolling mill to continue rolling. Finally, it will be reeled the wall thickness by reeling mill, sized by sizing mill, to achieve the specifications. It is a more advanced method that using continuous rolling mill to produce hot-rolled seamless steel pipe. 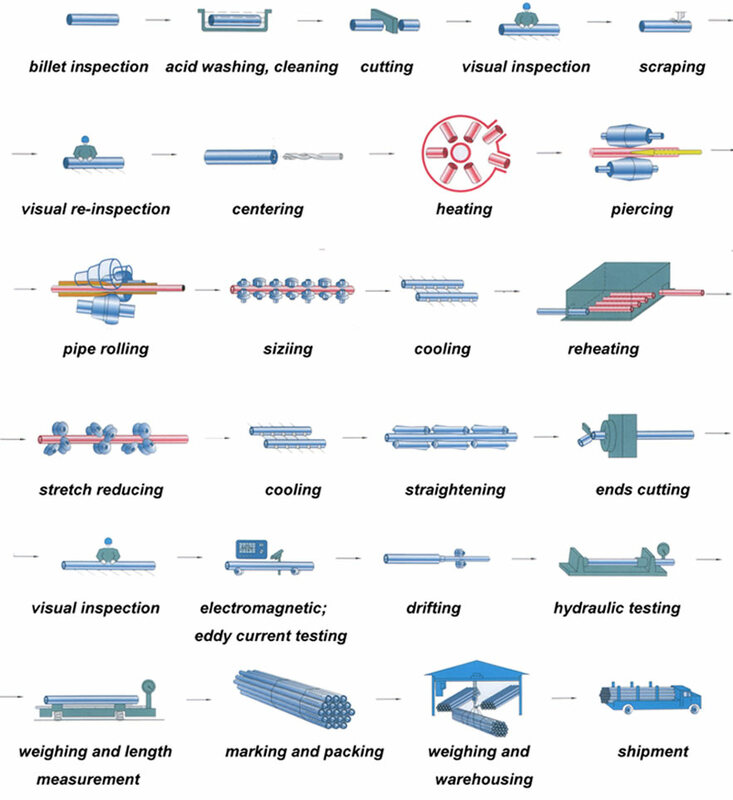 Round bars → heating → piercing → three-roll cross rolling, rolling or extrusion → detached → sizing (or reducing) → cooling → parison tube → straightening → hydrostatic test (or flaw detection) → mark → storage. Pipe end processing is conducted for steel pipe threading, sizing, thickening, strengthening heat treatment, such as chamfering process. Threading pipe ends use the corresponding coupling the pipe connected. Threaded connections required to connect high strength, good air tightness to prevent leakage of pipe breakage and transport medium. Steel wire in the car before the end usually after machining include: cutting, car cylindrical, boring, chamfering and face processing. These processes are generally a dedicated threading machines at once, and some can also be done on two machines. In order to ensure compliance with standards thread size, oil drill pipe using pipe threaded ends, factory various instruments required rigorous testing, test items include snails moment, tooth height, tooth, thread length, taper, tight moments and so on. Objective is to reduce the tube ovality, after machining steel to ensure dimensional accuracy , mainly for the oil casing. By the end of the post- sizing sleeve ends when threading a small number of black buckle, can improve the finished product rate. Pipe end sizing by cold deformation process, the common sizing methods are flaring punch and the punch flaring + sizing ring compression two kinds. Decreases when the punch tube expanding effect ovality depends largely on the uniformity of the pipe wall thickness. On the wall is not as hot-rolled tubes compared with severe cycle -type rolling machine rolling steel, the expanded diameter punch after the end of the tube surface quality deterioration. Therefore, in order to eliminate the impact of uneven thickness and decreasing pipe ovality, should be enlarged diameter punch + sizing ring compression method. Of cold sizing, the pipe end is elastically deformed but also only a small amount of plastic deformation. After sizing, the enlarged diameter of the transition zone and the non- expanded diameter, which may have different levels of residual stress, it may also occur due to sizing ring punch and the inner and outer surface scratches caused, resulting in a slight stress corrosion. Therefore, it should enhance the dimensional accuracy of hot-rolled steel, to avoid the use of the pipe end sizing method. Mainly used in petroleum pipes and pipe geology. After threading pipe ends due to wall thinning, threaded connections became part of the strength of the entire pipe weaknesses. In order to improve the strength of the threaded connection part, the use of thicker way to increase the pipe end pipe end wall thickness. In addition, multi-use drill pipe ends and tools welded connections, the weld and heat affected zone is the strength of the weak link. In order to improve the strength of the weld zone, generally thicker pipe end use. Pipe end upsetting the form of internal upset, EUE and internal and external thickened . 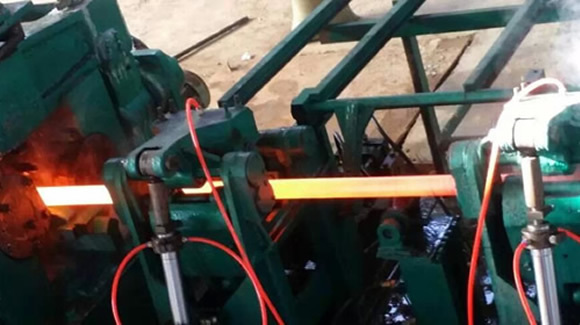 By heat treatment threading pipe end portion of the tube body strength of a higher intensity level. Pipe ends strengthening heat treatment processes include heating pipe end, quenching and tempering. Used to transport minerals, gas, oil, water and other media channels, usually caused by a root welded steel pipe up. In order to facilitate the welding between the pipes, the pipe end must be chamfered exterior angle. Requirements on pipe billet for hot-rolled seamless tube is related to and pipe varieties, uses and piercing methods. For general-purpose steel pipe tube quality requirements can be relaxed more, but the quality of important applications of tube steel and high-alloy steel pipe requirements must be strictly. Stress conditions better or lesser amount of deformation perforation method, without affecting pipe performance conditions, the tube surface and internal quality requirements may be slightly lower. Stress disadvantaged two-roll rotary piercing, if a large amount of deformation perforation, then the tube surface and internal quality have strict requirements. In short, steel tube technical condition is to ensure the quality and smooth production process as the basis to determine, and with different methods vary perforation, with the technical conditions of steel to improve and increase. Technical conditions can be found on a variety of tube standards and technical protocols. (3) Low magnification tube: not allowed ≥1 level of residual shrinkage, bubbles, anti-leather, white spots and cracks. For the average carbon structural steel billet, which generally loose ≤3 level, center porosity ≤3 level, segregation ≤3 level, subcutaneous bubbles ≤2. Ingot casting can destroy tissue, grain refinement of steel and eliminate defects microstructure, so that the steel dense tissue mechanical properties are improved. This improvement is mainly reflected in the direction along the rolling direction to a certain extent, the steel is no longer isotropic; pouring formed bubbles, cracks and loose, can be welded at a high temperature and pressure. 2. Residual stresses caused by uneven cooling. Residual stresses in the absence of external force from the internal equilibrium of stress, both hot-rolled steel section such various residual stress, the greater the cross-sectional size generally of steel, the residual stress is larger. Although the residual stress from equilibrium, but still has some influence on the performance of the steel members under loads. Terms such as deformation, stability, anti-fatigue effects may adversely. 3. Hot-rolled steel products, poor control of the thickness and width of the edge in this respect. We are familiar with thermal expansion and contraction, since the beginning of the hot rolling out even the length, thickness are standard, and finally cooled or there will be some negative difference, this negative difference edge width wider, thicker the more obvious manifestations. So for large steel for steel edge width, thickness, length, angle, and no law requires very precise edges. 2. Residual stress caused by uneven cooling. Residual stress In the internal self-equilibrium stress without external force, there are various sections of the residual stress in hot-rolled steel, the larger the general steel cross-section size, the greater the residual stress. Although the residual stress is self-balancing, it still has some influence on the performance of steel structural members under load. Deformation, stability, fatigue and other aspects may have adverse effects. Third, hot-rolled steel thickness and width in this area poor control. We are familiar with thermal expansion and contraction, since the beginning of the hot rolling, even if the length and thickness are standard, after the final cooling or there will be some negative difference, the negative width of the wide side, the more obvious thickness. So for large steel, steel edge width, thickness, length, angle, there is no law requires too thin edge. The oxide is required to be in a molten state when the mandrel is pre-punched. Its strength and other strict requirements. 1) The particle size of the oxide removing agent is generally required to be about 16 mesh. 2) The content of sodium stearate in the oxide removal agent should be above 12% so that it can be fully burned in the inner cavity of the capillary. 3) According to the inner surface area of the capillary tube, the amount of the oxide removal agent is generally determined to be 1.5-2.0 g/dm2, and the diameters of the capillary tubes of different diameters and lengths are different. 1) The injection pressure should be matched with the diameter and length of the capillary tube to ensure that the purge is strong, the combustion is sufficient, and the deoxidizer that is not completely burned cannot be blown away from the capillary by the air flow. 2) The purge time should be adjusted according to the direct and length of the capillary tube, and the metal oxide in the capillary tube is not blown out as the standard. 3) The height of the nozzle should be adjusted according to the diameter of the capillary to ensure good alignment. The nozzle should be cleaned once for each shift, and the nozzle should be removed for cleaning for a long time. In order to ensure that the de-oxidizing agent is uniformly purged on the inner wall of the capillary tube, an optional device is used at the spraying and deoxidizing agent station, and is equipped with a rotating air pressure. If the mandrel is not well lubricated or the mandrel lubricant temperature is too low, it will cause internal crusting. 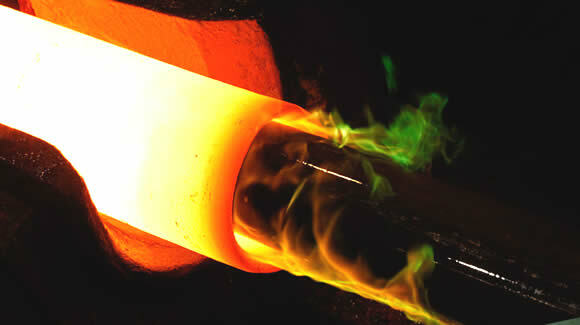 In order to increase the temperature of the mandrel, it is possible to use only one cooling water to cool. 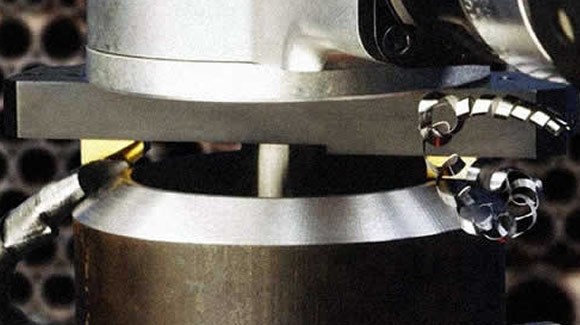 During the production process, the temperature of the mandrel rod must be strictly controlled to ensure that the surface temperature of the mandrel bar before spraying the lubricant is 80-120 ° C, and the temperature of the mandrel bar cannot be higher than 120 ° C for a long time to ensure that the lubricant on the surface of the surface before drying is dense and dense. Operators should always check the lubrication of the mandrel. (1) The products for hot-rolled steel pipe is not easy to control the edge width and thickness. Although we are familiar with expansion and contraction due to the beginning of the hot rolled out length, thickness up to the final cooling or negative difference,the wider this negative edge width is, the more obvious the thickness is. The seamless pipe process is much different from any other manufacturing process because it has no welds or seams. The pipe starts as a solid steel billet, and is then heated and placed over a piercing point which creates a steel shell. The process is finished further once the initial shell is created, and is then molded into the desired diameter and wall thickness. The pipe created from this process is made in a heated application, so the pipe should be fully normalized and have a consistent cellular pattern throughout the entire circumference of the material. Piercing is the first step of hot-rolled seamless steel pipe deformation, and its role is to solid hollow tube billet dressed as capillary. Hot rolled seamless steel tube round → heating → three perforated roll rolling, rolling or extrusion → detached → sizing (or reducing) cooling → straightening → hydrostatic test (or testing) logo → storage. Hot-rolled seamless steel ingot casting can destroy tissue, grain refinement of steel and eliminate defects microstructure, so that the steel dense tissue mechanical properties are improved. This improvement is mainly reflected in the direction along the rolling direction to a certain extent in the steel is no longer isotropic; pouring formed bubbles, cracks and loose, can be welded at a high temperature and pressure. After hot-rolled seamless steel tube round baked to go through the pressure puncher piercing. Generally more common punch is tapered roller punching machine, punching machine such high production efficiency, product quality, perforated expanding capacity, can be worn a variety of steel. After perforation, round tube has been three-roll rolling, rolling or extrusion. To squeeze off the pipe after sizing. Sizing mill into high-speed rotating cone drill through perforated steel embryo formed steel. Pipe inside diameter is determined by the outside diameter sizing mill drill length. After sizing the pipe into the cooling tower through spray cooling pipe after cooling, it is necessary to be straightened. After straightening the steel conveyor belt to the metal detection machine (or pressure test) for internal testing. If the internal pipe cracks, bubbles and other issues, will be detected. After the selection of steel but also through strict quality control manual. After the steel quality, spray paint on number, size, batch number and so on. By a crane into the warehouse. 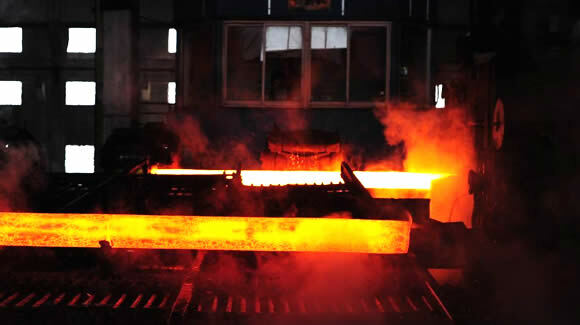 Hot-rolled is with continuous casting slab or blooming slab as raw material, after reheating furnace heating, high pressure water descaling into roughing mill, roughing material by the cutting head, tail, and then enter the finishing mill, the implementation of a computer-controlled rolling made the final rolling after coiling after the laminar cooling (computer-controlled cooling rate) and the coiler, straight hair volume. Straight hair the volume of the head, the tail is often poor, was a tongue-and fishtail, thickness, width, precision the edge often there is a wave-shaped, folding, pyramid defects. Coil weight heavier coil diameter of 760mm. (Normal pipe industry prefer to use.) Straight hair volume by the cutting head, tail cutting, trimming, and multi-pass straightening flat finishing line treatment, a cutting board or heavy volume, that is, to become: hot-rolled steel plate, flat hot-rolled steel coils, slitting with other products. Serve hot finishing volume descaled, pickled and oiled hot-rolled pickled coils. Cold formed is as raw material, after oxide removal by pickling tandem cold formed finished rolling hard roll, work hardening due to the volume of the rolling hard due to the continuous cold deformation strength, hardness rise, tough Plastic indicators declined, stamping performance will deteriorate, and can only be used for simple deformation of the parts. Rolling hard roll can be used as the raw material of the hot-dip galvanizing plant, hot dip galvanizing line set annealing line. Rolling hard roll weight is generally 6 to 13.5 tons, the coil diameter of 610mm. The general cold strip mills, volume should go through continuous annealing (CAPL unit) to eliminate cold hardening and rolling stress, or batch annealing reach the mechanical properties of the corresponding standard specifies. The cold-formed steel sheet surface quality, appearance, dimensional accuracy superior to the hot-rolled sheet, and right rolling thin product thickness to about 0.18mm. 1, cold formed steel to allow cross-section a local buckling, which can make full use of the rod buckling bearing capacity;-section hot rolled steel does not allow local buckling occurs. 2, the residual stress of the hot-rolled steel and cold-formed steel produced by different reasons, so the distribution of the cross section is also very different. The residual stress distribution in the cross section of cold-formed steel bending, residual stress distribution in the hot rolling steel or welded steel cross-section is a film type. 3 free torsional stiffness of hot-rolled steel, cold-formed steel, the torsional properties of hot-rolled steel is better than cold-formed steel.